In 2017 the Centers for Medicare & Medicaid Services (CMS) published new regulations governing ICFs/IID operations. A key change is a requirement infusing person centered planning practices throughout ICFs/IID operations. 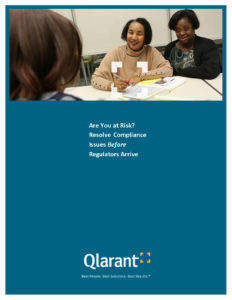 Qlarant has the experience, expertise, and resources to identify vulnerabilities and work with ICFs/IDD to mitigate potential risks and develop long-lasting solutions aligning facility practices with the requirements of government regulations. Click to continue reading white paper.